Cranky? Drink a Glass of Water | Freakin' Xtreme! Cranky? Drink a Glass of Water! Mild dehydration can trigger headaches, fatigue, and poor concentration among otherwise healthy men and women, according to two recent studies from the University of Connecticut. TUESDAY, Feb. 21, 2012 — Turns out trips to the water cooler boost your brainpower and improve your mood, in addition to providing a healthy dose of gossip. In two separate studies, researchers from the University of Connecticut studied the effects of mild dehydration on both men and women. Women experienced headaches, fatigue, and struggled to concentrate. They also perceived tasks as more difficult, though the low-level dehydration didn’t hinder their cognitive abilities. Slightly dehydrated men had trouble with mental tasks, particularly those involving memory and attention to detail. Overall, the studies concluded that women are more susceptible to such dehydration-induced changes in mood than men. So drink up, ladies. The trouble with mild dehydration: You feel it mentally before you do physically. Mild dehydration is measured as a roughly 1.5 percent loss in normal water volume in the body, but according to Lawrence E. Armstrong, PhD, one of the studies’ lead authors and a professor of physiology in UConn’s Department of Kinesiology in the Neag School of Education, we don’t feel thirsty until we are anywhere from 1 to 2 percent dehydrated. “By then dehydration is already setting in and starting to impact how our mind and body perform,” he said in a release. Both studies also point out that mild dehydration has the same adverse effects on mood, regardless of physical activity. You need to stay hydrated whether you’re sitting at your desk or running a half marathon. 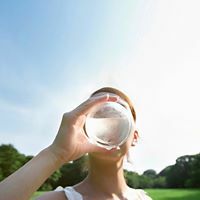 “Even mild dehydration that can occur during the course of our ordinary daily activities can degrade how we are feeling — especially for women, who appear to be more susceptible to the adverse effects of low levels of dehydration than men,” study co-author Harris Lieberman, PhD, said in a release. So next time you find yourself feeling irritable or unproductive at the office, you may want to reach for a tall glass of H2O instead of a latte or a piece of chocolate. Dehydration may be to blame. What makes you moody? Do you feel less productive when you don’t drink enough water? This entry was posted in Water and tagged H2O, health, mild dehydration, minerals, nutrition, water, wellness. Bookmark the permalink.